So UVXY gaped down this morning when the overall market is in a somewhat overbought short-term trading trend. I had to take advantage of a quick bounce that UVXY usually does after gaping down in the morning. 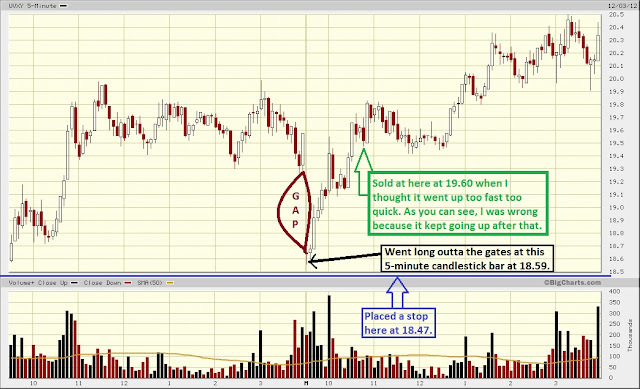 Went long 400 shares at 18.59 a share the second it opened at around 9:33a.m ET, and placed my stop at 18.47. It was somewhat of a gamble of where I put my stop, but looking back on Friday's chart I think it had a good support level around 18.50. Sold UVXY at 19.60 when I thought it went up too quick too fast for a 1.01 point gain. Now I'm wishing I didn't sell so soon because it ended the day going up almost another dollar by the close.